First Line: "There's a witch in Oyster Bay," Dixie, the roller-skating dwarf and diner proprietor, announced. 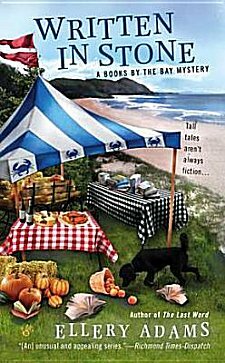 Although Olivia Limoges has more than enough on her plate at the moment with preparing for the Coastal Carolina Food Festival, she finds herself seeking out this so-called witch. Munin Cooper is the woman known as the Witch of Oyster Bay, and she tells Olivia that death is coming. Little does Olivia know that it's Munin's own death that the woman foretold. Left with Munin's last memory jug embellished with keepsakes that she feels will lead to the identity of the killer, Olivia is drawn into a past that's much darker and much more dangerous than she ever realized. I've mentioned before that I tend to treat cozies as lighter fare and very seldom ever give them the highest rating. (Yes, I realize I've been behaving like a snob.) Written in Stone is the cozy that changes all that. There's so much going on in this book that it's best if you start the series at the very beginning; otherwise, the significance of certain things is going to whiz right over your head. Yes, I've been with this series from the beginning, and from the first book (2010's A Killer Plot), I had a feeling that I'd found something different. Olivia Limoges could very easily be called yet another "poor little rich girl." Having been abandoned by her father and going to live with an unemotional relative after the death of her beloved mother, Olivia learned how to spend her money wisely and well-- and to keep herself emotionally removed from others. Moving back to Oyster Bay and purposely making herself a part of the small community has very gradually been forcing Olivia to change her ways. However, she's still not always comfortable with social situations, and she doesn't always say what other people want to hear. In fact, some readers may prefer her dog, Captain Haviland, to Olivia. Another thread woven throughout Adams' series is the sometimes shocking information Olivia continues to gather about both her parents, and what she learns often has a bearing on the outcome of the mystery. The Books By the Bay writers group works much more on solving the mystery in this book than they do on readying manuscripts for publication, but there's so much going on in Written in Stone that there's simply no time. What I was happy to see is that there's a strong story line involving Millay. She gets to be seen in a whole new light, and I for one definitely like what I see. Another thing that sets this book apart is how much sympathy is shown for the killer. Normally the "bad guy" is the bad guy, and that's that. Here the person's background and history are gone into just enough to show how heartbreaking the twisting of a human being, the creation of a killer, can be. Written in Stone is the best book in the series so far. There's a richness to Adams' stories, a depth to her characters, that makes this series rise above the rest. It feels to me as though this author is on a clearly defined mission, that she knows exactly where she wants to take Olivia-- and I'll be following her every step of the way. Cathy - One of the things that strikes me about what you've said here is the story arc about Olivia's family and the local history. It's not easy to keep a story arc interesting over a few books in a series but this one sounds well done. It is well done, Margot. It's almost as if the idea for this series sprang full-grown from Adams' forehead and that she knows each and every step of the series' prgression through the books.